NB: Linked in this Friday's Forgotten Books roundup. Over the past week or so I've been showcasing a small selection of British first editions of second novels by female authors. Two of those British first editions – the 1956 Cresset Press edition of Patricia Highsmith's The Blunderer and the 1978 Duckworth edition of Penelope Fitzgerald's The Bookshop – are really rather scarce (and ordinarily quite expensive)... but I reckon this final second novel by a female author I'm showcasing is the scarcest one of all. 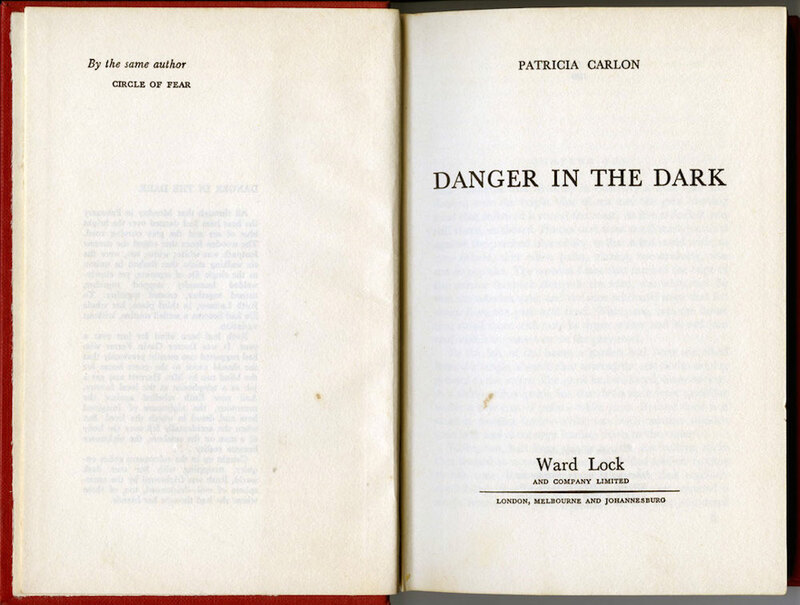 Patricia Carlon's Danger in the Dark was published in hardback in the UK by Ward Lock in 1962, under a very rarely seen, uncredited dust jacket designed, it is surmised by Jamie Sturgeon in the comments below, by Oliver Brabbins (I've added it to the Existential Ennui Beautiful British Book Jacket Design of the 1950s and 1960s page). 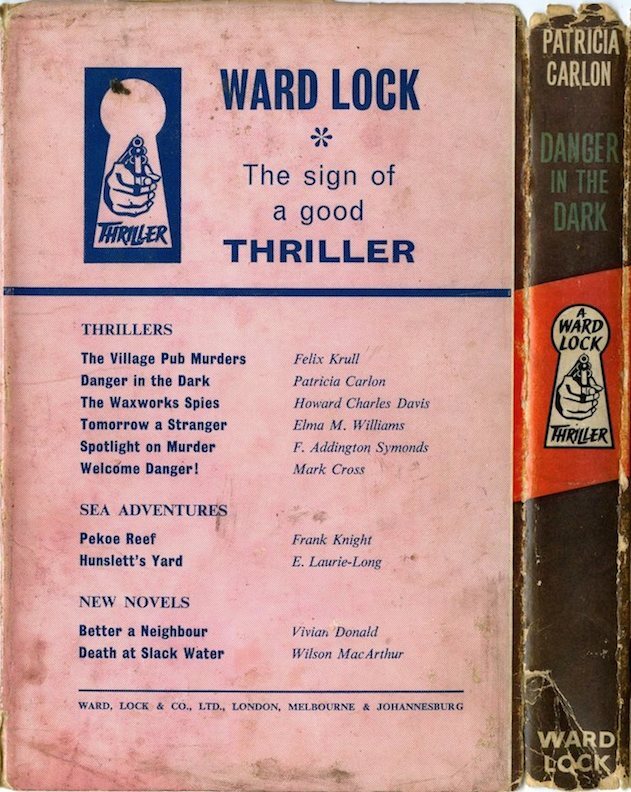 To date, the Ward Lock edition has been the only printing of the novel; in common with the other thirteen novels Carlon published from 1961–1970, originally it wasn't issued in her native Australia, but unlike a good many of those novels, it hasn't been reissued since – in any territory. As a consequence, at time of writing there are no copies of the novel available online (I bought the only one). I came across Patricia Carlon's name by chance earlier this year and was intrigued. 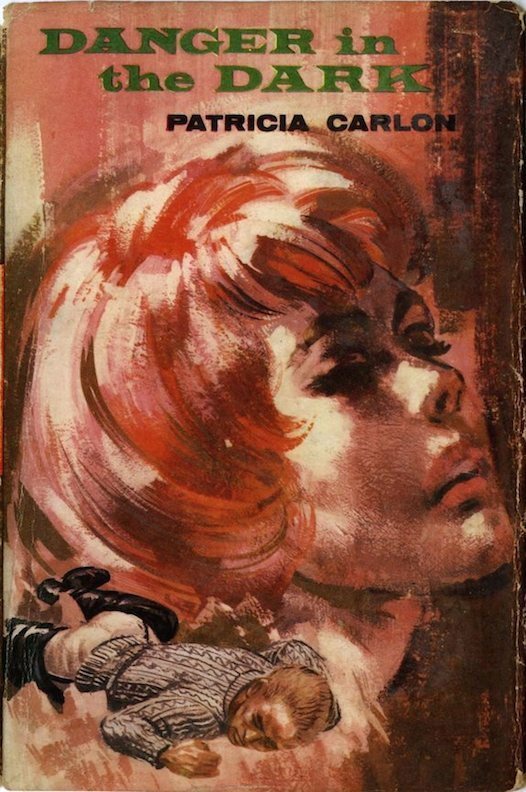 After those fourteen novels in the 1960s, all of which were published in the UK by either Ward Lock or Hodder & Stoughton (under their King Crime banner; by the looks of it no paperback rights were sold in Britain), little was heard of Carlon until the early 1990s, when two of her novels, The Whispering Wall (1969) and The Souvenir (1970), were belatedly published in her home country by the Wakefield Press; a few years after that the Soho Press in America began reissuing her novels as well, bringing her to a whole new audience. Following her death in 2002 it was discovered that Carlon had been deaf since the age of eleven, something that a number of commentators have noted seems to have informed her writing (this 2002 Sydney Morning Herald obituary is the best overview of Carlon's life and work that I've seen). Danger in the Dark provides perhaps the starkest example of this, in that the novel's young heroine, Ruth Latimer, is (newly) blind. Exiled by her doctor, Gavin Ferrer, to Havenrest, a kind of coastal halfway house for the blind, Ruth stumbles upon the body of a man washed up on the seashore, and is plunged into a nightmare of suspicion, mistrust and murder. 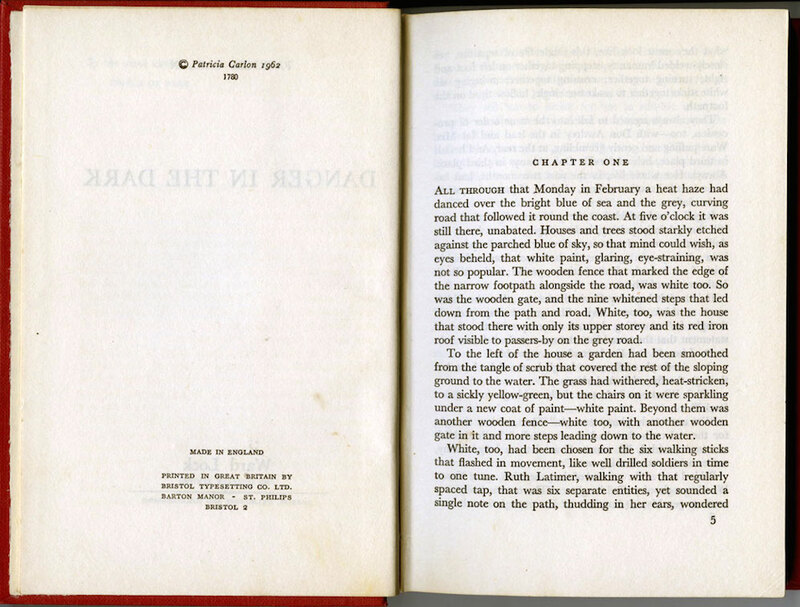 Carlon's work has been compared to Alfred Hitchock's in the way she builds suspense, and I can certainly see that here: she ratchets up the tension throughout and only provides release at the end of the penultimate chapter (leaving just enough space in the final chapter for an explanatory confab). For me, though, she lacks the forceful prose and psychological heft of, say, Patricia Highsmith – with whom she's also drawn comparison – although that may well be down to my general disinterest in murder mysteries; by and large I couldn't care less about the identity of the killer in a whodunnit (a curious thing thing for a crime fiction enthusiast to admit, I suppose, but there you go). Still, Carlon is an interesting writer, and those who revel in this sort of thing will doubtless find much to divert them in Danger in the Dark. And I'm not about to dismiss her on the basis of one novel; this 1999 January Magazine review of Crime of Silence (1965) has aroused my curiosity, as has this 2000 WAG Magazine review of The Price of an Orphan (1964) and The Unquiet Night (1965). Merits further investigation, I feel. I read about her and her novel The Unquiet Night in one of those Forgotten Friday posts and had to seek out a copy. Which I did but of course haven't yet got around to reading. After reading this post on Danger in the Dark I moved The Unquiet Night to my nightstand. And you are not kidding - there isn't a copy of Danger in the Dark anywhere! It appears that there is not a single library copy in the USA. The nearest copy is at Trinity College Library in Dublin. You deserve a prize for finding such an obscure yet desirable book. Have not been able to read all of her books but I like the ones I have read very much. THE UNQUIEt NIGHt was one of them. My library used to have a a few but no longer. Thanks for the comments all. 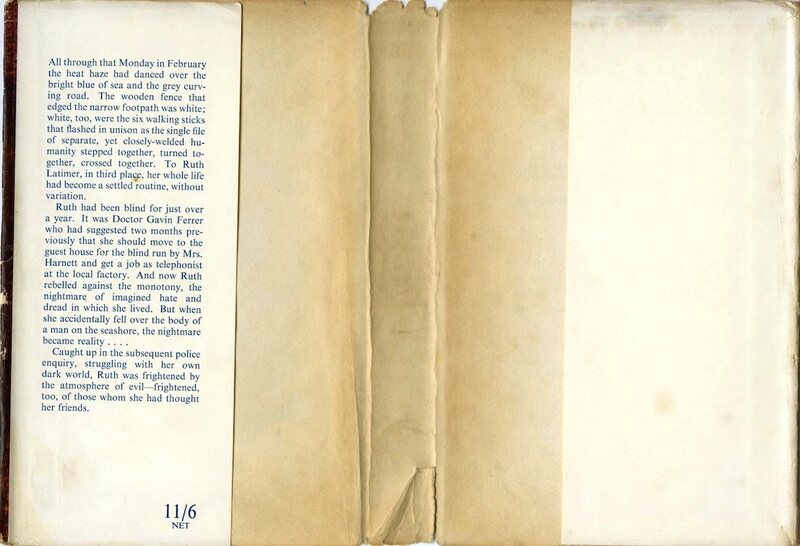 Jamie, I've updated the post according to your info and placed the cover on the Beautiful British Book Jackets page under Brabbins's name. Yet another book finding coup, Nick. Congrats! Of those reprinted by Soho THE WHISPERING WALL is well worth reading. Sort of a "Sorry Wrong Number" plot but with a terrific and terrifying twist by making the "ear-witness" a bedridden stroke victim who cannot speak. I liked THE SOUVENIR and THE RUNNING WOMAN as well. But WHISPERING WALL is rather original and often frightening unlike her other more derivative work. Comparing her to Highsmith is misguided I think. I'd call her the Margaret Millar of Australia. Yes, Highsmith isn't the best comparison, I agree, although that hasn't stopped a number of commentators bringing her up in relation to Carlon. I've never read any Margaret Millar, but Jamie Sturgeon was singing her praises to me when I visited him, and sold me one of her books accordingly. After reading THE WHISPERING WALL, I bought all the Soho Press editions, and have been disappointed that they didn't issue everything of hers. Excellent article. I discovered her around 2004 with The Unquiet Night and her writing inspired my own stab at suspense.